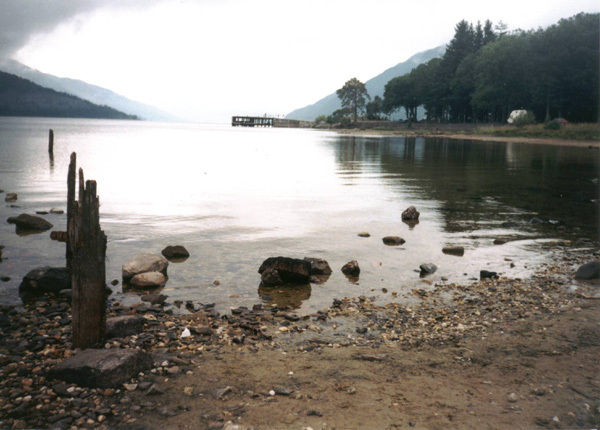 There's a well known song about the 'bonnie, bonnie banks of Loch Lomond' which has made Scotland's largest area of fresh water famous throughout the world. Stretching from Balloch, north of Glasgow, to Ardlui, the loch is surrounded by high mountains, with dense woodland carpeting the slopes as they sweep down to the water's edge. The West Highland Way skirts the eastern shore, and the second below Ben Lomond, the most southerly Munro, forms part of this fine circuit, which is suitable for just about all ages and abilities. The walk strikes out on a good forest track, returning through woods by the water, where it is possible to discover roe deer or wild goats grazing silently among the trees. This countryside forms part of the 75,000 acre Queen Elizabeth Forest Park, managed by the Forestry Commission, and walkers are welcome to discover its charms. Set off from the information board within the car park and head north along the single track road to Rowardennan youth hostel. The path splits at the hostel gate and the walk continues along the right hand option, passing a metal gate and following a West Highland Way marker. After a few yards, the track forks again. Take the left arm and cross a small stream, before skirting along behind the hostel. The path passes a cottage and a new house on the right, then bears left to cross a burn before heading through mixed woodland, bramble and bracken. Cross the next junction and the track passes a stone shed, then crosses a cattlegrid and runs along the shore of Loch Lomond to Ptarmigan Lodge. At the entrance to the lodge, bear right and the track climbs to a metal gate. From here, it rises through silver birch, beech, oak and rowan and curves up past a narrow waterfall, cutting a tight course down a deep crack in the rocks. The ascent continues for some distance until the highest point is reached, from where it's downhill all the way to the next junction. At the lowest point of the track, an obvious grassy path branches off to the left, curving down through a peaceful green woodland to the lochside, emerging at a beach with views across the water to Tarbet. At the top of the beach, the track meets a path. Follow this south into the trees and go quietly for you may be lucky enough to spot roe or red deer. The path undulates gently along the bank of the loch and if you're out after rain take care on rocks and tree roots which can be slippery. Continue south and, beyond a bridge made of railway sleepers, there's a fine sandy beach which makes an ideal lunch spot with fine views down Loch Lomond. Carry on until a wooden footbridge is reached. Once across this, the path bears left up a narrow flight of makeshift steps rising through bracken to rejoin the track above Ptarmigan Lodge. From here, retrace your steps to the start. Map OS Landranger 1:50,000 sheet 56 or Harveys West Highland Way map. Start/parking Public car park at Rowardennan pier, grid ref NS 360986. There are public toilets in the car park. Grading Sheltered track and path through woodland and along lochside. Suitable for all.